The Ash Barty Miami skyrockets Australian into top 10. 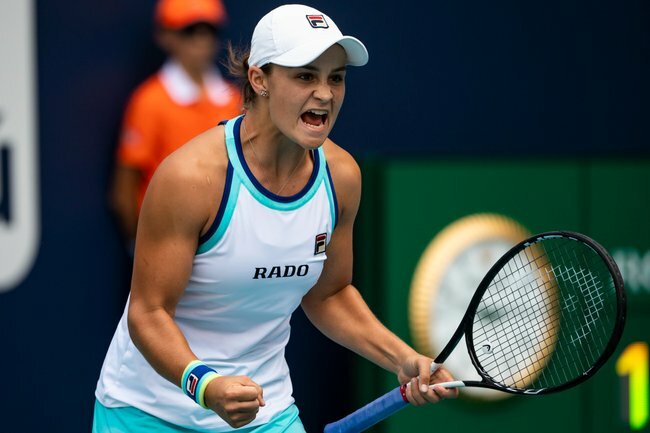 Ashleigh Barty has claimed the biggest WTA title victory of her blossoming career by becoming the first Australian to win the Miami Open. The Queenslander cemented her rise into the top 10 rankings for the first time – the first Australian to do so since Samantha Stosur 2013 – with a 7-6 (7-1) 6-3 win over fifth-seeded Karolina Pliskova on Saturday. The Australian No.1 was 3-1 down against 27-year-old Pliskova but responded with excellent shot-making to force a tiebreak and outclass the Czech world No.7 by winning six straight points for the first-set. Barty broke the big-serving Pliskova in a 12-minute game to open the second set and from there on the fatigued Czech, whose semi-final win over Simona Halep finished after 1am local time earlier in the day due to rain delays, put up little resistance. Barty pumped her fists when Pliskova sent a forehand long on match point to hand the 22-year-old her fourth WTA title and a $1.3 million ($A1.8m) winner’s cheque. The victory capped a memorable week for 2011 junior Wimbledon champion Barty, who took a break from tennis in 2014 to play professional cricket for the Brisbane Heat. Barty, the 2018 US Open women’s doubles champion, will be No.9 when the WTA rankings are published on Monday. Barty said the key to the win over Pliskova was extending rallies on the warm day in Southern Florida. “It was important for me to try to make it physical,” she said in an on-court interview. Barty fired a career-high 15 aces, with Pliskova barely making an effort to return some of them.